Terry Brooks? More like Terry Audiobrooks! Audiobooks are a thing I have recently found a very specific niche for in my life - namely, I like to listen to them when I'm on a long drive, since I find that listening to a spoken word story makes it feel like I have company in the car and provides the perfect balance between being interesting enough to hone my attention but not distracting enough to actually divert that attention from the road. Of course, when listening to audiobooks for this purpose, choice of subject matter is a delicate and important thing. You obviously don't want to listen to something with ornate, finely-crafted prose which you will want to read and savour in printed form. And you definitely don't want a story which is so complex as to be distracting - or so detailed that if you don't listen to any more of it for a month or so you end up entirely lost the next time you pick it up. For this purpose, I've found epic fantasy to be more than suitable fodder. 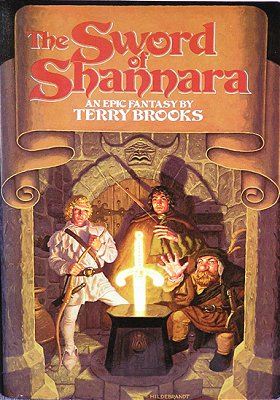 Specifically, it's prompted me to rediscover the dubious pleasures of Terry Brooks' Shannara series. The Sword of Shannara takes place in what, so far as I can make out, is intended to be a world centuries after a devastating nuclear war. As you might expect with such things, the geopolitical lie of the land has been radically simplified as a result; in the region the story unfolds in, there is the Southland, home to human beings, the Westland, home to the elves who had apparently been off in magic land before the war and then came back afterwards, then in the Eastland you have the dwarves who are mutant humans who ended up all short due to living in cramped underground fallout shelters for generations, and lastly in the Northland you have similarly mutated humans in the form of the gnomes and the trolls. In Shady Vale, a sleepy village in the Southland, there is an inn belonging to the Ohmsford family. Flick Ohmsford is a typical robust young Valeman, taking after his father; Shea Ohmsford is smaller and slighter, being the half-elven son of a distant cousin of the Ohmsfords who left Shea with them before dying. Shea has been adopted into the family and brought up as a brother to Flick, which is lucky because he will need all the help he can get, for unbeknownst to him he is the last direct descendant of Jerle Shannara, ancient king of the elves. This is important because, as the mysterious Allanon shows up to explain, this means that only Shea can use the power of the Sword of Shannara, a magical blade forged to destroy the Warlock Lord. The Warlock Lord was once, centuries ago, a member of the same order of Druids as Allanon - a cabal out to rediscover and protect the ancient wisdom of the pre-war era and ensure that such knowledge was used responsibly - but the Warlock Lord decided to take shortcuts to power and researched the ways of the occult, which eventually gave him vast magical power and mastery of the Northland. Now, as he does every few generations, he intends to spark a massive war to conquer the world, and Shea needs to get his hustle on to retrieve the Sword. But what can one dude with a sharp stick do against the awe-inspiring power of the Warlock Lord? This is about as straight-ahead bog-standard as high fantasy gets, and is often derided for being unoriginal. Admittedly, there's something to the charges of unoriginality. Numerous important components of the novel conspire to create the impression that Brooks has read no other works of fantasy, and might have read no other books whatsoever, outside of Tolkien before setting to work on this. You have a reluctant hero coaxed out of sitting around in a safe and comparatively luxurious part of fantasyland by a wandering wizardy sage with a mysterious backstory. You have a quest to take down the Dark Lord, using an item which constitutes his one weakness. You have an expansive party of humans, elves and dwarves assembled to help the hero, who scatter to the four winds at a particular point in the narrative. You have a long trek across the blighted landscape of the Dark Lord's home turf. You have battles and desperate sieges taking place to keep the characters who don't march into the dark land busy. You have a king brought low by an evil advisor's manipulation. You have a snivelling, pathetic little creature becoming supernaturally fixated on the magic item which is the object of the grand quest, with the long-term result that they end up dying in an absurd accident during the final climactic moments of the quest. You have a Dark Lord who spends by far the majority of the novel firmly offstage and who makes his presence known mostly through his sinister wraithlike agents. You have a comparative lack of female characters. You have a bildungsroman format. Oddly, this would be less annoying than it is if Sword were mere pastiche; as it stands, though, there's flashes of something a bit more original flickering here and there in the undergrowth, and thanks to all the Tolkien mimicry it's all too easy to overlook it. For instance, there's the whole "wake of a nuclear war" thing, which is at its most prominent when the party camps out in a ruined modern city and gets attacked by an archaic killbot. The fact that the city is almost entirely overgrown is a particularly nice touch which suggests that Brooks had given at least some research to the question of just how quickly human settlements would be reclaimed by nature. On top of that, Brooks shows a knack for adding in a bit of classic swashbuckling adventure of a sort that Tolkien never really dabbled in. Perhaps the best example of this is the whole "evil advisor" subplot, which despite looking like a riff on Tolkien when considered in the abstract looks more like a riff on Dumas when you zoom in and look at the specifics. Indeed, Allanon himself appears to consciously practice the sort of realpolitik and manipulation other authors mistake for wisdom when they have their Gandolf stand-ins do it. For instance, the real power of the Sword to defeat the Warlock Lord is a somewhat hokey, trite thing - it is not the power of friendship, or the power of believing in itself, but it's in the same general ballpark - and at the end of the book when Shea asks why Allanon didn't just tell him, Allanon explains that a) Shea probably wouldn't have believed him, b) even if Shea had believed him, the explanation is so absurd as to be demoralising, since there was very little chance of Shea believing it would actually work, and c) in general Allanon just didn't have that much confidence in Shea, which he's a little embarrassed about. This is far more grubbily believable than the whole "I always believed in you, random sap with no appreciable applicable skills I plucked out of a kitchen!" that third-rate high fantasy wizards usually spout. For that matter, Brooks also seems refreshingly honest with himself about how the characters come across; Shea spends much of the book being a weedy, weepy wimp, and at the climax he actually has to confront and accept the fact that he is a weedy, weepy wimp. The main problem I have with Sword is, happily, a problem that is somewhat alleviated by listening whilst driving: Brooks over-explains everything, to an extent that plot twists are signalled miles in advance and parts of the book become extremely repetitive, as he spends an entire paragraph to explain five times what could be explained once in a terse sentence. Some plot points are particularly laboured in this way - over and over and over again, Brooks has the same characters going through the same "Allanon is keeping secrets from us and not telling how the Sword is supposed to work!" mental process. Were I reading the prose, this would be maddening, but it's really handy when driving, because I can be confident that if I miss something because I am concentrating too hard on the road it will be explained to me again in short order. I recently took a stab at the first few chapters of this as blog fodder. It wasn't so much the unoriginality of the plot that got to me, so much as the fact that the story, world and characters are deeply, crushingly uninteresting. The whole post-apocalypse thing is interesting in theory (and to be fair I didn't get anywhere near the ruined cities or killbot), but when the book starts off with the characters living in a convivial fantasy inn in a twee little fantasy hamlet in the forest I have a hard time caring about what else the setting includes. Although I did get a kick out of the fact that the Mordor analogue is named the Skull Kingdom. There are interesting characters in the book, it's just that Allanon's entire game plan hinges on covering up how interesting he actually is, and the Ohmsfords are the absolute least interesting characters around, possibly in the entire series. Admittedly, the killbot bit is more or less the only part where the postapocalypse stuff really prompts a deviation from the high fantasy playbook. Apparently the later books in the series include somewhat more overt appearances of sci-fi technology. Of course, when listening to audiobooks for this purpose, choice of subject matter is a delicate and important thing. You obviously don't want to listen to something with ornate, finely-crafted prose which you will want to read and savour in printed form. I think there's a distinction between prose which works really well in written form, and prose which works really well spoken, and the Venn diagram of the two has a substantial amount of overlap but the overlap is not absolute. Is this the series that has the horrible Objectivist politics? There was a shortage of fantasy book title options and also a very narrow range of fantasy author names back then. You're thinking of Terry Goodkind's The Sword of Truth. Brooks began publishing a good fifteen to twenty years before Goodkind, and despite sort of being the epitome of That One Modern High Fantasy Writer is apparently a rather pleasant man. I have no idea about Goodkind on the personal front, though, beyond the fact that his moral attitudes are fairly alarming and probably don't make him the most affable of party guests. Wow. I thought "this is rather clichéd" while watching the Lord of the Rings movies (I like them, but really more for the style than the plot or characters), but of course, Tolkien invented the clichés, so he's got a good excuse. But this sounds like barely disguised plagiarism. And "Warlock Lord"? Seriously? And it's not a genre parody? I find audio books to be very useful to keep my thought processes from turning in on themselves (in ways relating to depression / anxiety disorder) during activities that don't require mental concentration (cleaning, gardening, etc.) and while falling asleep. At the same time, it's the only way I've found I can get through some books that are either boring plot-wise, or worse, cursed with overly lengthy and dry prose. For example an audio version was the only way I finally made it through "The Lord of the Rings" trilogy, after giving up twice somewhere in the Lothlorien episode during my teens. Ditto the latter Harry Potter books. And I'm currently listening to The Magicians' Guild trilogy by Trudi Canavan, who, despite the YA-typical plot and characters, seems to think her readers are 10-year-olds with the memory of a goldfish who need everything explained not once but again and again. (Well, actually, I've been re-listening my way through old Pratchett novels for the last couple of weeks, as a palate cleanser, because the social implications of the former started to piss me off too much – hetero romance between a female teenage student and her previously emotionally abusive over-30 teacher, who also murdered innocent people in the past but is supposedly a good guy; gay relationship between characters that never ever seem to touch, while the hetero characters have pillow talk scenes…) And I wish I had found an audio version for Aliette de Bodard's Aztec mystery / fantasy novels, instead of having to slog through the interminable descriptions of people's clothes by myself. But it really does have to be a talented reader. Jim Butcher's Dresden Files are perhaps made more enjoyable by James Marsters' reading (so much so that the one book he couldn't do due to scheduling conflicts was recently re-released with Marsters as a narrator, due to popular demand). And the Discworld novels certainly benefit from Steven Briggs' voice-acting. On the other hand, I've found novels that I enjoyed reading almost ruined by a mediocre or just badly chosen audio book narrator. This unfortunately happens especially with the more niche novels (read: scifi / fantasy with non-straight and/or PoC protagonists) which usually aren't written by big name authors with guaranteed high sales. It's understandable – high quality voice actors cost more than some random guy - but still, it's regrettable if the result is something I can't bear to listen to, and so I don't get to re-experience some of my favorite novels unless I can actually make time to read for hours on end. Interesting. I guess I have an easier time following audiobooks than you do, Arthur, and keeping track of what's going on. I sometimes find myself in the position of putting down a book (audio or otherwise) for weeks, even months at a time, but I can usually pick it back up again and get back into the flow of the story with little trouble. All the memory space which ought to be devoted to remembering things like people's names, or “where have I seen you before, again?” seems instead to be occupied with remembering stories in some detail for long stretches of time. I listen to audiobooks all the time in my day-to-day life (my iPod is overrun with audiobooks and podcasts, and only a smattering of songs), and since really good prose isn't something I prioritize, I usually go with the audio format if I can manage it and don't worry if I'm missing out on the author's use of language. One thing you and I can agree on, though, is that audiobooks are superb for car trips. I find them a great means of fending off boredom without taking up too much of my brainspace to impede my ability to respond to the needs of the road. For whatever reason, I'm also able to follow fairly complex material while I'm driving—at least as well as when I'm not driving—so I don't have to be too discriminating about what kinds of books are for in the car as opposed to out of the car. Apart from one abridged audiobook when I was a kid, I have no experience with the series, and no opinions on it one way or the other. I must say, though, I don't consider the “Medieval fantasy setting is actually a post-apocalyptic future Earth” all that innovative. I felt the same way when we had the Prince of Thorns discussion a couple of years back. I can imagine it was fresh when Brooks began writing, but it seems downright cliché by this point. Cheriola: And I wish I had found an audio version for Aliette de Bodard's Aztec mystery / fantasy novels, instead of having to slog through the interminable descriptions of people's clothes by myself. Yeah, lack of an audiobook version is the only reason I haven't dug into her novels thus far. I'm a slow reader, and there are so many other books ahead of hers in my reading queue. the Discworld novels certainly benefit from Steven Briggs' voice-acting. No kidding. Although I think Nigel Planer has an edge over Brooks when it comes to voicing Death. I don't think I've ever had bad narration actually ruin an audiobook for me, but I've definitely encountered ones where I heard the narrator and said to myself 'Really? this is the voice we're going for with this book? *deep sigh* O-kay then …' And now that you mention it, one of the most recent times I had that experience was with a book I specifically sought out because it had a non-binary protagonist, so that part fits, also. Oh, and I'm still curious: is Sword a Terabrooks in audiobook as opposed to hardcopy format? If you're actually bothering to read the hardcopy rather than just having the audiobook on in the background it isn't so much as "Terabrooks" as a "mistake". Since I just mentioned the Nightrunner series by Lynn Flewelling in another comment: Book 4 of those (Shadow's Return) was one case where the narrative voice really grated for me. I'm curious, which book with a non-binary protagonist were you talking about? Took me a day or two to remember the title: it was “Lizard Radio” by Pat Schmatz. Creative world-building, even though dystopias aren’t exactly my favorite, but I wasn’t enamored with the narrator, sorry to say. Hm... How bad a dystopia are we talking about here? I don't mind reading such in principle, as long as it's not relentlessly depressing (like The Handmaid's Tale) or specifically designed to make the life of LGBT characters even worse than in real life, because the author thinks that tragedy is the only way to inspire sympathy. I'm reading the phrase "government-run Cropcamp" in a review right now, and I'm thinking: Gulag? Or just like when my mother had to work a few weeks as a farmhand / harvest helper as part of her non-agriculturally-related university studies, which no-one liked, but which served to make the whole class bond quickly? Also, I'm reading the phrases "poetic style" and "flowery language" and I get flashbacks to Wraeththu... I have a relatively low tolerance for purple prose. How bad is it, compared to, say, an Anne Rice novel? The dystopian angle isn't too bad. More regimentation and indoctrination and generally restricted freedoms than, say, the North American Indian Schools of the 19th and early 20th centuries. Some characters die, but it's not like they're in The Hunger Games, or anything. And the society isn't particularly oppressive towards non-binary people, it's pretty much an equal opportunity oppressor. I confess I didn't completely understand what the story was doing with the non-binary characters, but my best recollection from when I listened to it a year ago was that the protagonist's treatment was treated as more discordant than traumatizing. That might just be because I missed some undertones which actual non-binary readers would more likely pick up on, though. I've never read Anne Rice, and even if I had, I'm afraid I'm the last you want person to ask for a consultation on prose. It has to be damn near ultraviolet for me to recognize - and that's just in print form. I'm not sure if I've ever noticed bad prose in audio format. Sorry.